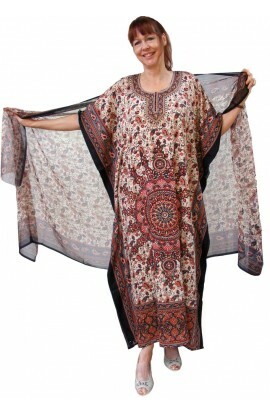 A fabulously comfortable, warm, cosy full-length fleece kaftan. Great to snuggle up in in the winter evenings, or to wear in the daytime. Once you own this item, you will never want to be without again. A GREAT GIFT TOO! You would be praised and thanked time and time again. Choice of three standards lengths. Free-sized to loosely fit UK dress sizes 14 to 30. Coice of three lengths..
Bespoke service also available for people outside the standard size. A beautiful Cornflower-blue Fleece kaftan. This warm fleecy kaftan made in excellent quality fabric is available in three lovely colours. Suitable for men or women. It is free-sized and very loose-fitting, and suitable for UK sizes 14 to 30. Available in a choice of leng..
Fleece Kaftan - Micro-fleece. Snow Leopard design. SUPER-SUPER-SUPER SOFT FLEECE FABRIC. 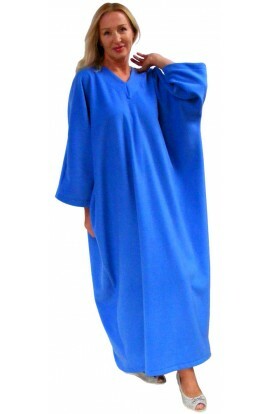 The kaftan is ONE SIZED - FREE SIZED and LOOSE-FITTING. SUITABLE TO LOOSELY FIT UK SIZES 14,16,18,20,22,24,26,28 Available in a choice of length to suit your height, 49,53,or 57" Also..
A beautiful Fleece kaftan in Sandy-Beige. This warm fleecy kaftan made in excellent quality fabric is available in three lovely colours. Suitable for men or women. It is free-sized and very loose-fitting, and suitable for UK sizes 14 to 30. Available in a choice of lengt..
A beautiful Strawberry (Queen's Pink) Fleece kaftan. This warm fleecy kaftan made in excellent quality fabric is available in three lovely colours. Suitable for men or women. It is free-sized and very loose-fitting, and suitable for UK sizes 14 to 30. Availabl..